About 37% of hearing loss in Australia is caused by preventable noise exposure. Preventable hearing loss occurs when the hair cells that line the hearing organ (the cochlea) become damaged by exposure to loud sounds. Repeated exposure to loud sound over time can increase the severity of the hearing loss. By monitoring what you listen to and for how long, the risks of acquiring a hearing loss can be significantly reduced. It’s important to know your risk – and take action! Can Every Day Sounds Cause Hearing Loss? 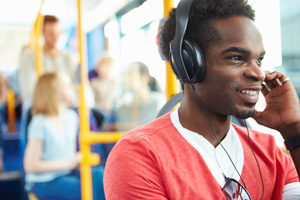 In 2010, the National Acoustic Laboratories released the Binge Listening report, which revealed that young Australians are at risk of having a hearing loss through leisure activities such as nightclubbing, listening to music with headphones and attending live music concerts. People who listen to loud sounds for long periods of time in the workplace or in their leisure time, have a higher risk of acquiring a hearing loss. Modern living and technologies such as cars, airplanes and other forms of machinery now expose people to more environmental noise than ever before. The environments in which we spend our time at work or relaxing directly impacts on our hearing abilities. QUICK REMINDER: The higher the noise level and the more frequently you are exposed to it, the greater the chance it will damage your hearing – especially if exposure occurs over a long period of time. A combination of the above. For example, if you acquire a hearing loss due to exposure to harmful noise, this will be added to the hearing loss developed as you age. Most people find out that they have a hearing loss by noticing how their hearing abilities impact on daily activities such as being with friends and family or going to work or school. The effects of having a hearing loss are not always immediate and it may take some time to become noticeable. turning one ear towards a speaker to hear sounds better. If you experience more than one of the signs of hearing loss shown above, it’s worthwhile discussing with your GP and having your hearing tested; you don’t need a referral to see an audiologist. Can I Have An Operation To Fix My Hearing? The vast majority of hearing loss can not be treated through medical treatment or surgery. An audiologist can advise the most appropriate options to manage your hearing loss condition.